In treaties signed with the U.S. Government, our ancestors made great sacrifices by ceding millions of acres of land to the federal government in exchange for certain protections for our traditional and cultural values and ways of life. Article Five of the Treaty of Point Elliott guarantees the signatory tribes the right of taking fish at their usual and accustomed grounds and stations in common with all citizens as well as hunting and gathering roots and berries on open and unclaimed lands. Despite the federal government’s guarantees to tribes that they would be able to take fish as they always have, throughout the first half of the 20th century Indian fishermen faced fierce opposition to exercising this right from the State of Washington and non-Indian fisherman. These tensions led to battles in court, all of which contributed to the decision made by Judge George Boldt in US v Washington also known as “The Boldt Decision”, the foundational Indian treaty fishing rights case. In 1905, the United States Supreme Court handed down the first decision addressing treaty fishing rights in U.S. v. Winans. In that case, the United States brought suit on behalf of the Yakima Nation against the Winans Brothers who, by attaining a permit for a fish wheel from the State of Washington had not only depleted the Yakimas’ fish supply but had also prevented them from accessing their traditional fishing grounds. The Supreme Court’s decision laid the foundation for the interpretation of treaties in the future and produced what was later called the “cannons of treaty interpretation”. The Supreme Court in US v Winans held that treaties are “not a grant of rights to the Indians, but a grant of rights from them and a reservation of those not granted”. The Supreme Court’s ruling states that issues of treaty interpretations must favor Indians as they were at a severe disadvantage during the negotiations which took place in a foreign language and often with the threat of violence. The court also notes that treaties must be interpreted the way the Indians of the time would have understood them. This idea is critical because our ancestors were deeply concerned about having access to all the places that they had always gathered and their concerns were heard by Governor Stevens who reassured them that they would always have access to their traditional places and resources. I wish to speak my mind as to selling the land. Great chief! What shall we eat if we do so? Our only food is berries, deer, and salmon. Where then shall we find these? I don’t want to sign away my right to the land…..I am afraid that I shall become destitute and perish for want of food. You understand well my purpose, now you want to know what we desire to do for you. We want to give you houses and having homes you will have the means and the opportunity to cultivate the soil to get your potatoes and to go over these waters in your canoes to get your fish. We want more, if you desire to go back to the mountains and get your roots and your berries you can do so and you shall have homes and shall have these rights. The courts determined that though the Winans Brothers acted lawfully by the standards of the State of Washington; they had violated the Yakima Nation’s treaty rights by restricting their access to traditional fishing grounds. In 1942 Sampson Tulee, a member of the Yakima Nation, was convicted in the Superior Court of Klickitat County for catching salmon with a net without obtaining a license from the State of Washington. Tulee appealed to the Supreme Court on the grounds that the Washington State statute violated his treaty right. The court, in Tulee v. Washington, held that while the State of Washington had the right to regulate Treaty fishing outside the reservation for the conservation of species, it could not charge a fee to Indians for the license required. We believe that such exaction of fees as a prerequisite to the enjoyment of fishing in the ‘usual and accustomed places’ cannot be reconciled with a fair construction of the treaty. We therefore hold the state statute invalid as applied in this case…It is our responsibility to see that the terms of the treaty are carried out, so far as possible, in accordance with the meaning they were understood to have by the tribal representatives at the council and in a [315 U.S. 681, 685] spirit which generously recognizes the full obligation of this nation to protect the interests of a dependent people. While these cases represent “wins” for treaty tribes and their members they are also directly reflected in the decision of Judge Boldt in US v Washington. Over 100 years after the signing of the treaty and years of conflicts over treaty fishing, the U.S. sued the state of Washington in 1970 on behalf of Washington’s treaty tribes. Stay tuned for our next article which will focus on the landmark Indian Law case US v Washington and other treaty fishing decisions all the way through to the culvert case. OLYMPIA, Wash. — American Indian tribal members arrested while exercising their treaty fishing rights before 1975 would get the chance to clear their criminal records under a bill headed to Gov. Jay Inslee’s desk. House Bill 2080 passed the Senate unanimously Wednesday. It passed the House in February. The measure would allow tribal members to apply to the sentencing court to expunge their related misdemeanor, gross misdemeanor or felony convictions. Family members and tribal officials could also seek a vacated criminal record on behalf of a deceased person. The court would have the discretion to vacate the conviction, unless certain conditions apply, such as if the person was convicted for a violent crime or crime against a person. Sen. Adam Kline, D-Seattle, said the bill corrects a mistake. “It’s the closest this branch of government can come to an apology,” he said. Tribal members and others were arrested in the 1960s and 1970s while asserting their right to fish for salmon off-reservation under treaties signed with the federal government more than 100 years before. At the time, however, those acts violated Washington state regulations, and there were raids by game wardens and other clashes with police. The Northwest fish-ins known as the “Fish Wars” were modeled after civil rights movement sit-ins and were part of larger demonstrations to assert American Indian rights nationwide. 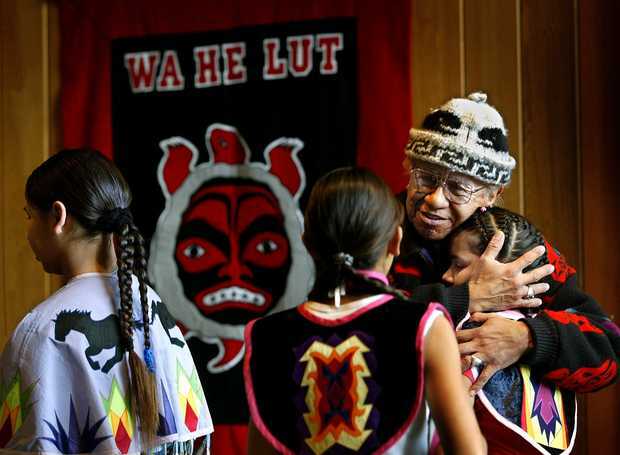 Sen. John McCoy, D-Tulalip, said he knew a tribal elder who wanted to travel to Canada but couldn’t due to a felony conviction for asserting his fishing rights. “He’s passed away but I’m sure his family members would appreciate it,” he said of the bill. Everyone involved in Whatcom County’s water rights disputes seems to agree that a local settlement would be a good idea, but representatives of Lummi Nation have made it clear they will not sacrifice Nooksack River salmon to benefit farms, industries or cities. Speaking at a May 30-31 water supply symposium at the Hampton Inn in Bellingham, Lummi Nation attorney Diana Bob said the facts were clear. 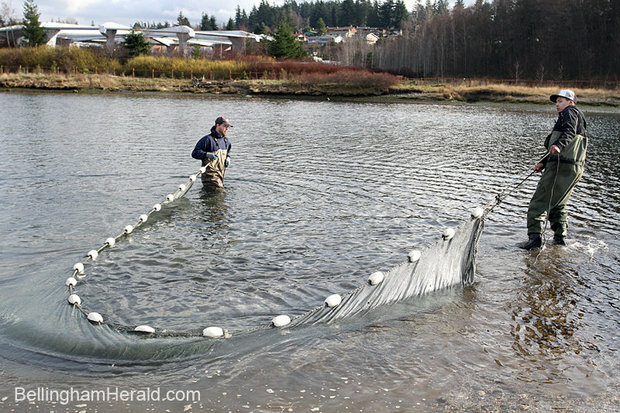 Dan Kruse, left, and Robert Teton of the Lummi Natural Resources Department, use a net to try to catch juvenile salmon to count on Feb. 15, 2012 at Marine Park in Bellingham. The department counts juvenile salmon around Bellingham Bay about once every two weeks. 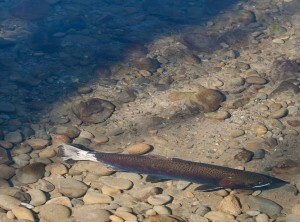 The Lummi and Nooksack tribes have asked federal agencies to file a lawsuit on their behalf to help determine the amount of water they should be guaranteed to bolster Nooksack River salmon stock. The flow of water in the Nooksack and its tributaries is reduced by withdrawals of water for the city of Bellingham and Cherry Point industries, but Whatcom County farms withdraw even more to irrigate raspberries and blueberries. River water is also used to irrigate cow pastures in dry months. Both the Lummi and the Nooksack Indian Tribe have a federally recognized right to catch Nooksack River salmon. The tribes have asked federal agencies to file a lawsuit on their behalf to force the state to take steps to define the amount of water that they should be guaranteed, to bolster the flow of water in the river and its tributaries. That likely would mean curbing the amount of water that other users are allowed to withdraw. The tribes asked the feds to file the lawsuit more than a year ago, and so far there has been no word of a response. Farmers admit that more than half the water they withdraw is not authorized by state law. Farm groups’ attempts to negotiate a deal with tribes have broken down, as have negotiations between the tribes and city of Bellingham. The city diverts water from the middle fork of the Nooksack River to replenish its direct water source, Lake Whatcom. While the city has reduced its take of river water and could likely cut it even more, berry growers could be badly squeezed. Marty Maberry, a prominent fourth-generation berry grower, said he too wanted to see salmon populations increase. He suggested that if farmers can get enough water to stay in business, they could help bolster the amount of water in streams by drilling new wells to spill into streams. He said underground water supplies are abundant in the county. In many cases, pumping from wells also can reduce the flow of water in nearby streams, making solutions complex. But cutting off the water supply to Whatcom County farms is a poor response, Maberry said. We’re in the most natural place to grow food that you can find anywhere in the United States,” Maberry said, adding that putting farmers out of business because of tribal water and fishing rights would embitter the community. Lummi representative Randy Kinley said the tribes don’t want to put farmers out of business, but they are not afraid of stirring up resentment if that’s what it takes to guarantee their rights. “We’ve been there and I’m not afraid to go back there,” Kinley said, referring to the 1974 federal court ruling that recognized treaty fishing rights and forced dramatic reductions in salmon harvests by non-Indians. Kinley and others noted that withdrawal of Nooksack water for agriculture has increased rapidly in recent years with little oversight by the state or Whatcom County. Whatcom County’s Cherry Point is home to two oil refineries and an aluminum smelter that provide hundreds of high-wage jobs. They also use significant amounts of Nooksack River water, supplied by Whatcom County Public Utility District. The proposed Gateway Pacific Terminal coal export pier also would use river water from the PUD. PUD spokeswoman Rebecca Schlotterback said Gateway Pacific has already lined up its water supply via a PUD contract that extends to 2042. While the PUD has a legal right to Nooksack water to cover its industrial customers, that right (and every other Nooksack River water right) is considered “junior” to the tribes’ water rights, since they were here first. Attorney Jay Manning, former chief of staff to Gov. Chris Gregoire and former director of the Washington Department of Ecology, said the PUD’s right to its water supply is not ironclad in that situation. Other water users also may be ahead of the PUD in the water line, if the available supply of water is cut back by a court order that allocates a larger share of water to the tribes for salmon populations. Manning urged the crowd not to despair. He said workable solutions can be developed at the local level. Perry Eskridge, government affairs director for the Whatcom County Association of Realtors, said local solutions would be best. Several speakers urged people to continue to work for a local agreement. Two of those speakers suggested that the tribes still may be motivated to make a deal, because there is no guarantee that the federal government will agree to take the state to court, and no guarantee such a court action would give the tribes all the water they want for salmon. Michael Mirande, adjunct professor at Seattle University School of Law, said legal uncertainty has spurred out-of-court settlements of thorny water rights cases elsewhere. If any one person was absolutely certain they would prevail in a lawsuit, they would have sued long ago,” Bucknell said. Bucknell also observed that no settlement will be painless. “If you think there’s a solution that everyone in this basin is going to love, you’re delusional,” Bucknell said. Reach John Stark at 360-715-2274 or john.stark@bellinghamherald.com. Read his Politics blog at blogs.bellinghamherald.com/politics or follow him on Twitter at @bhamheraldpolitics.